This week, all things considered, you should rather be in Philadelphia. Why should you consider traveling to Philadelphia, Pennsylvania, for Philly Beer Week, which begins this morning and runs through 9 June? 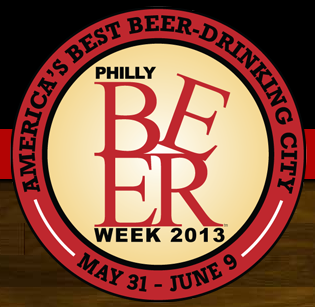 Philly Beer Week is a 10-day celebration of the Best Beer-Drinking City in America. Established in 2008, it’s the largest beer celebration of its kind in America, featuring hundreds of festivals, dinners, tours, pub crawls, tastings and meet-the-brewer nights to area bars, restaurants and other locations throughout Greater Philadelphia. Since its inception, nearly 100 other cities worldwide have copied Philadelphia’s success to launch their own beer weeks. This week, all things considered, I'd rather be in Philadelphia. Alas, I won't be, but you should.